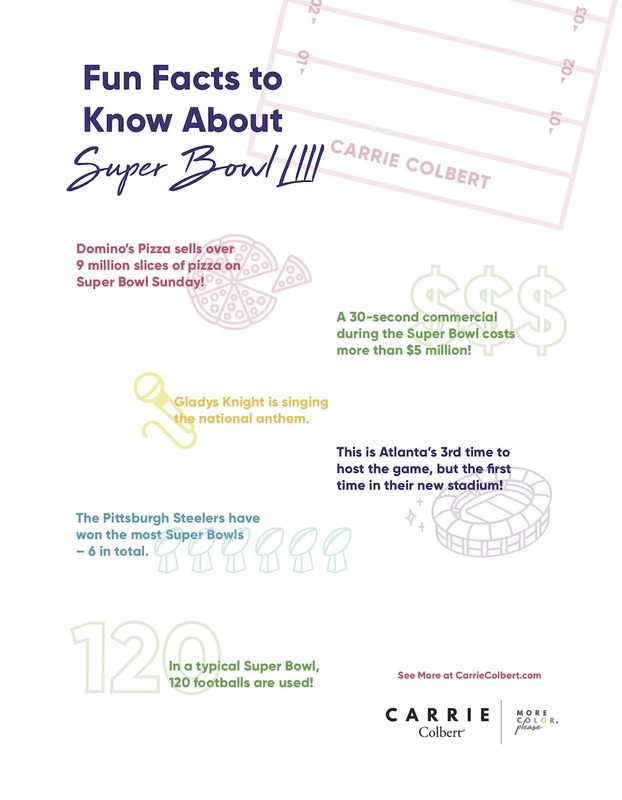 Whether you’re into the sport or not is pretty much irrelevant – the Super Bowl is a big deal in almost any household. Fun fact: I watched last year’s Super Bowl (where my beloved Eagles finally won!) with Carrie. The amount of amazing food and cocktails was astounding, and of course there was a lot of conversation going on (never my favorite part of the Super Bowl, to be honest). 1. Super Bowl LIII (53) will be on Sunday, February 3 with a 6:30 p.m. ET kickoff where the New England Patriots will face off against the Los Angeles Rams. This will be the Patriots third straight Super Bowl appearance. 2. This year’s Super Bowl will be held in Atlanta at Mercedes-Benz Stadium, home of the Atlanta Falcons. The stadium opened in 2017, so it will be the first time it’s hosted here, but not the first Super Bowl in Atlanta. Super Bowl XXVIII (1984) and Super Bowl XXXIV (2000) were both in the no-more Georgia Dome. 3. Seven-time Grammy Award-winner Gladys Knight will sing the National Anthem as part of the pregame festivities and Maroon 5 is scheduled to perform the infamous halftime show. 4. Did you know Patriots QB Tom Brady (41) is older than Rams Head Coach Sean McVay (32)? McVay is also the youngest Head Coach to play in the Super Bowl. 5. Most people know about the Patriots offense already (led by Tom Brady), but the Rams will likely put up a fight thanks to their Running Back, Todd Gurley. Gurley rushed for the most touchdowns in the league this season (17) with 1,251 rushing yards, so it’ll be fun to watch the two offenses square up on game day. 6. Speaking of Tom Brady (because aren’t we always in the NFL world? ), did you know he has secured more Super Bowl appearances than every single NFL team (other than the Patriots)? For instance, Brady has played in 9 Super Bowls (counting this one) while the Cowboys, Broncos and Steelers have each played in 8 – as a team (via CBS Sports HQ). 1. Super Bowl is actually two words. The grammar police in me goes crazy when I see people use it as one, so now you know. 2. For all the jewelry lovers out there, did you know the winning team receives the Vince Lombardi Trophy, which is seven pounds of sterling silver, handcrafted by Tiffany & Co.? 3. In 1967, it is reported that a 30-second commercial spot cost $40,000. Fast-forward to 2017 and the same commercial averages between $5 – $5.5 million! 5. The average ticket price back in 1967 was just $6. Now tickets usually go for a few thousand and more than 35% who attend the game write it off as a corporate expense. 6. The team who has played in the most Super Bowls: New England Patriots (11 – counting this one). 7. The team who has won the most Super Bowls: Pittsburgh Steelers (6). 8. The 2020 Super Bowl will be played in South Florida. 9. During a typical Super Bowl, 120 balls are used. 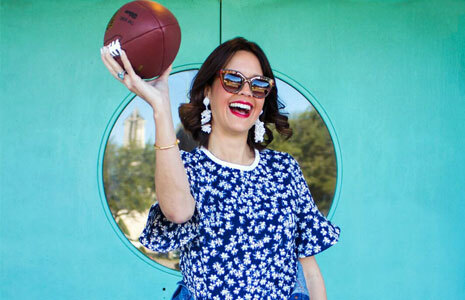 Avid football fans aren’t the only ones who score big on Super Bowl Sunday. If you’re a foodie, you’re in luck as it’s the second highest food consumption day of the year (behind Thanksgiving of course). 2. Although homemade snacks on game day are my personal favorite, pizza is a fan favorite for many. It’s the biggest day of pizza sales all year. Domino’s Pizza says they expect to sell about 9 million slices of pizza that day, nearly a 44% increase than a typical Sunday. The average pizza order that day is $26.45 (according to RetailMeNot). 3. Beer, popcorn and hotdogs (not to mention antacids the very next day) are also consumed in mass consumption. 4. According to Forbes, 1.33 billion chicken wings are eaten on Super Bowl Sunday. Read the other sports articles I’ve partnered with Carrie on, here and here. Have an interest in another sport or big game? Drop a comment below or shoot us an email and we’ll try to add it to the content calendar. And click here to download the free printable you see above and share it with your friends! Now, tell us who you’re rooting for in the comments below! This week on Wear + Where + Well is dedicated to recapping my fashion week looks. Today's focus is London Fashion Week (LFW). Shades of blue and a pop of green.